The Toronto Blue Jays announced today that they have signed OF RYAN LANGERHANS and RHP RAMON ORTIZ to minor league contracts with invitations to major league spring training. Toronto also signed INF LANCE ZAWADZKI to a minor league deal. Langerhans, 32, played in 96 games with the Triple-A Salt Lake Bees (Angels) of the Pacific Coast League last season. The outfielder hit .250 (84-336) with 21 doubles, six triples, 11 home runs and 54RBI. He was promoted to Los Angeles for two games in May (0-1 at the plate). Langerhans has spent parts of 10 seasons in the major leagues between the Braves, Mariners, Nationals, Angles and Athletics. He has posted a .226 average with 58 doubles, 12 triples, 33 home runs and 125RBI in 593 career big league games. His last appearance in the International League was 2008 when he hit .310 in 62 games for the Columbus Clippers. Ortiz, 39, spent last season with the Scranton/Wilkes-Barre Yankees and was 13-6 with a 3.45ERA in 27 starts for the International League North division winners. He struck out 104 batters and walked just 37 in 169.1 innings of work. The veteran finished second in the IL in wins and innings pitched and ninth with his 3.45ERA. 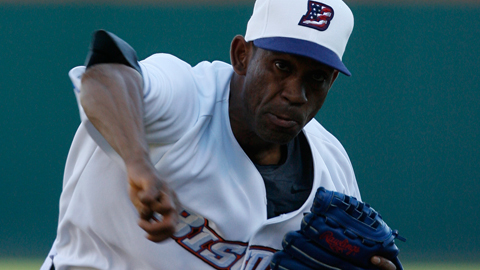 Ortiz made eight starts with the Bisons in 2010 and was 2-3 with a 3.94ERA and one complete game. A World Series Champion with Anaheim in 2002, Ortiz has pitched in 296 career major league games with the Angels, Twins, Rockies, Dodgers, Cubs, Nationals and Reds since his big league debut in 1999. He has a career record of 86-84 with a 4.93ERA and 887 strikeouts in 1423.0 innings of work. Zawadzki, 27, averaged.231 (34-147) with three home runs and 17RBI in 48 games with the Gwinnett Braves in 2012. He made his major league debut with the Padres in 2010 by appearing in 20 games for San Diego (.200, 1RBI).